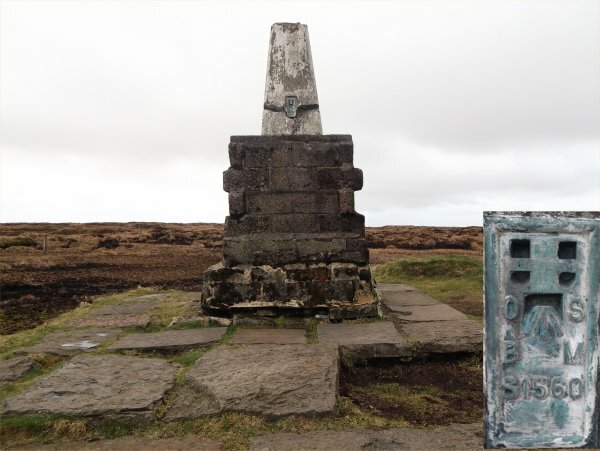 There are 83 photos for this trigpoint (view album). 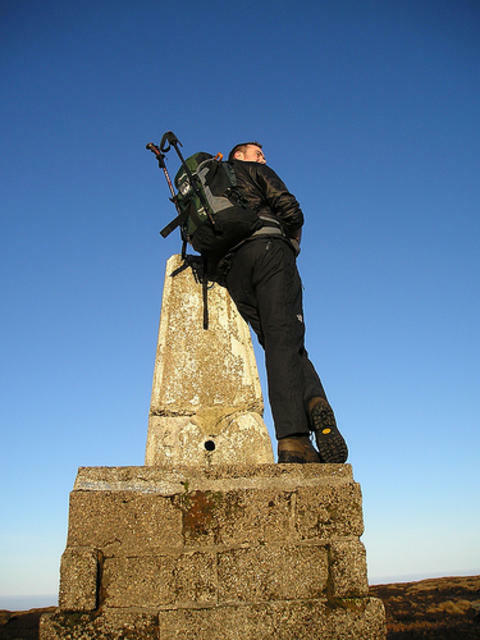 Is ranked joint 2239th with 25 other trigs (more). See 73 more in the album. Beautiful day. 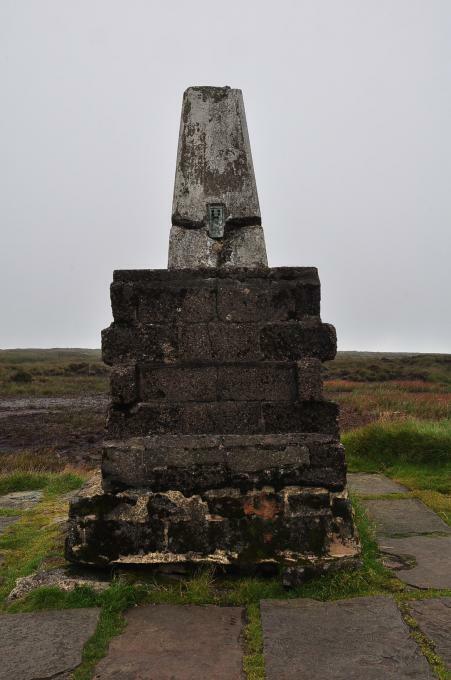 First visit for 20 years, part of a "horseshoe" taking in Hedgehope Hill. 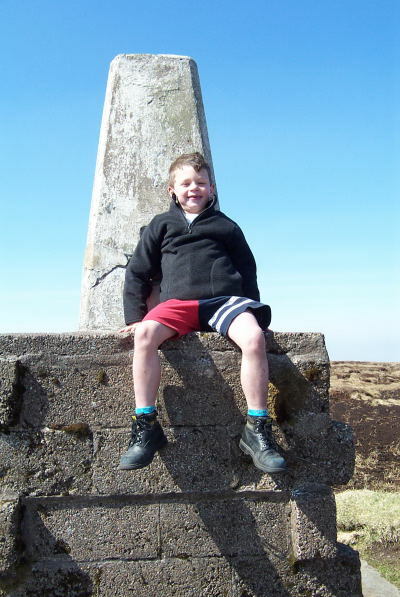 Walked up from Wooler, great walk and the sun came out on the summit, result. 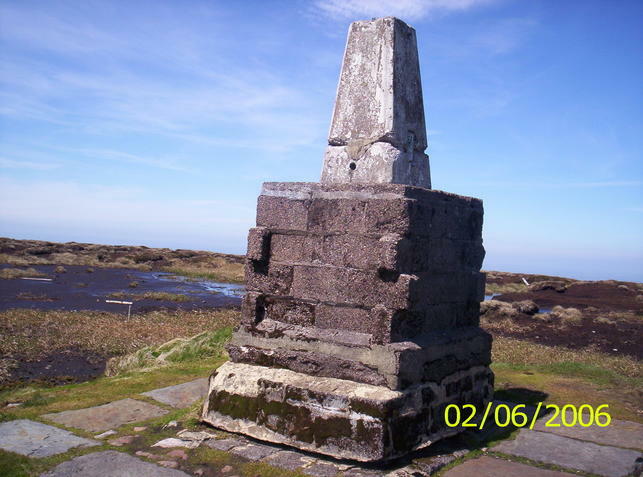 Visited with P61 on Horseshoe round what a fantastic pillar great views from up top,on to Hedley Hill next on our way home. 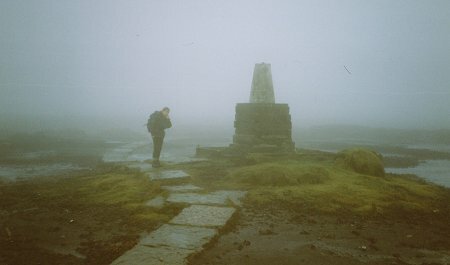 Followed on from comb fell on the horseshoe of 2000ers. 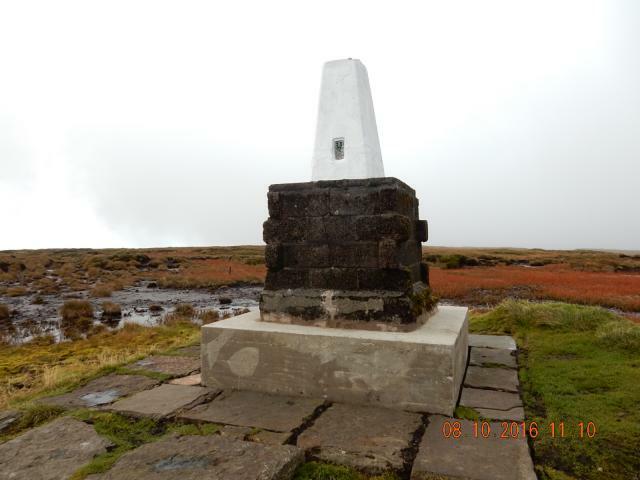 The trig has had a revamp and is set on a massive plinth very boggy summit that has been tamed with rossendale mill stone flags great views from the edge. 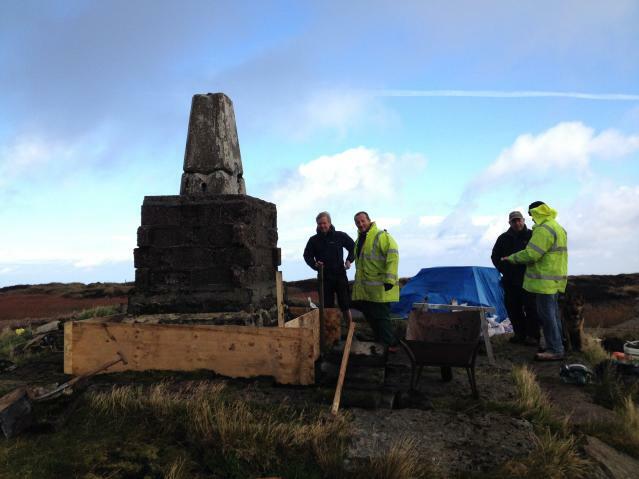 A new concrete base has been built, stones rebuilt, trig point repaired. A very good job, well done to those who did it. 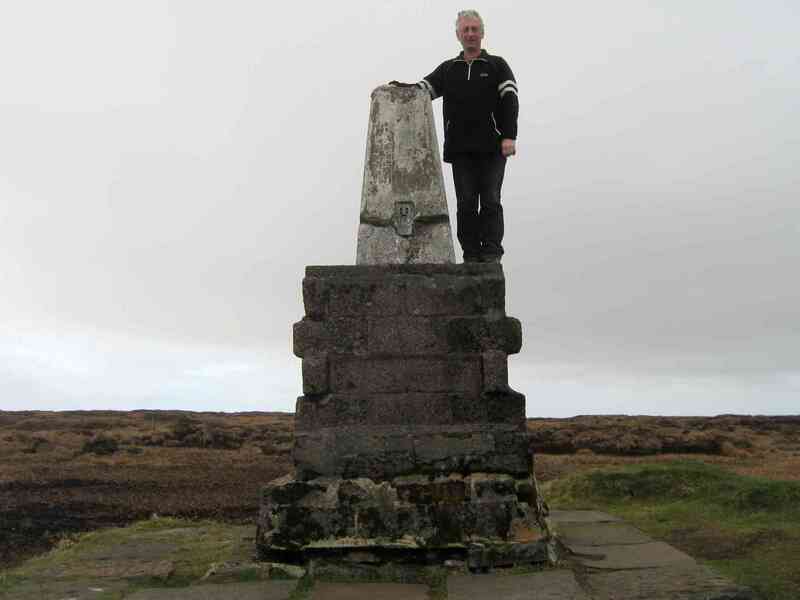 If you want to see my walk to this trig point you can view it on my Boz North's Trail blog. Happy to report pillar has been 'consolidated'. 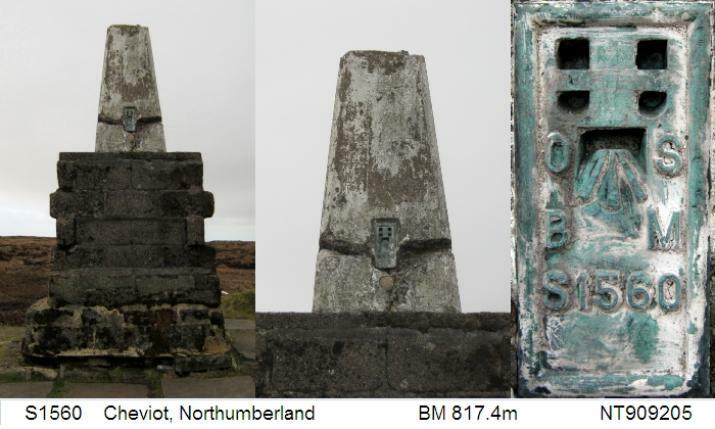 Work has been completed to repair plinth and pillar. Has also had a fresh coat of white paint. Damage to the top remains with the ends of all 3 spider arms exposed. Top cap missing, asphalt plug replacement; LHD side sight hole open.Light cloud down on the hill so views only to surrounding peat hags. Bagged after Hedgehope Hill. Low cloud so no view. 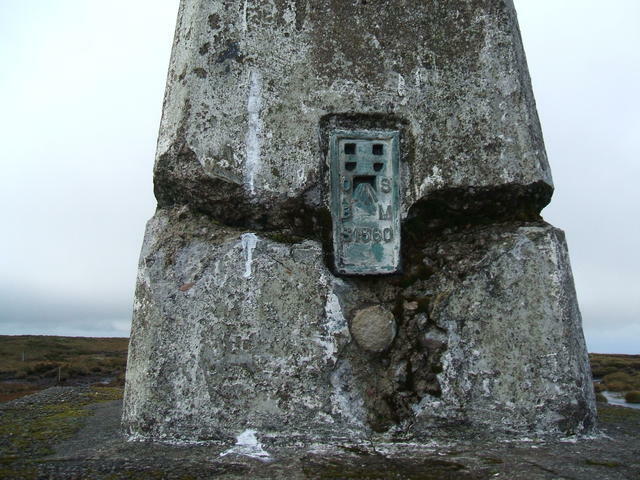 The plinth has a large crack near the base and a sign indicates that remedial work to stabilise it will soon take place. There looked to be enough bags of cement at the site for a complete rebuild! with David. Northumberland county top. Parked at end of road to Langleeford. Boggy walk up, easy to follow paths. 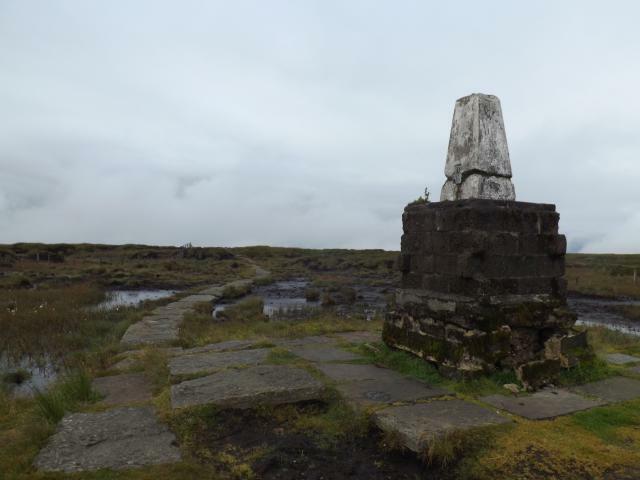 Beautiful views, summit is very flat and very Boggy. 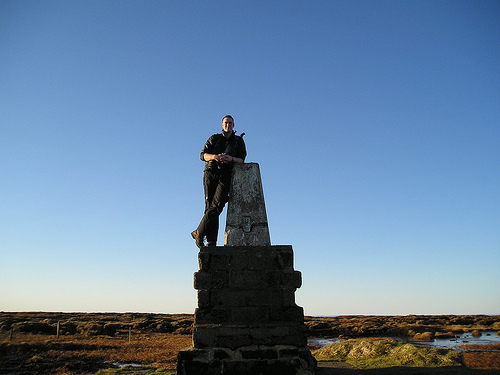 Top of Northumberland, strangely didn't feel that high up. Sunny. Up from Cold Law. 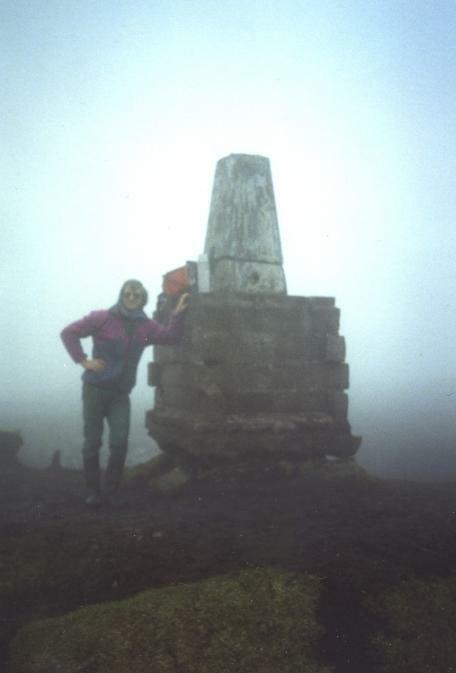 Unfortunately due to low cloud yet another county top pillar with no views but gives me an excuse for a return visit. 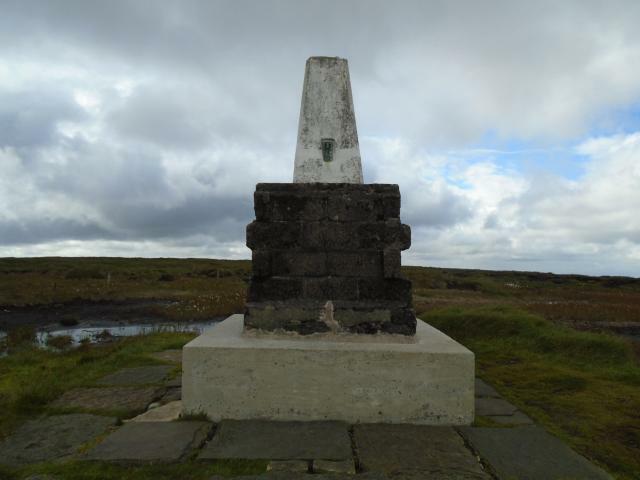 Last trig of the Pennine Way (18th I think). So windy for the last half mile to the top that I could hardly stand up. 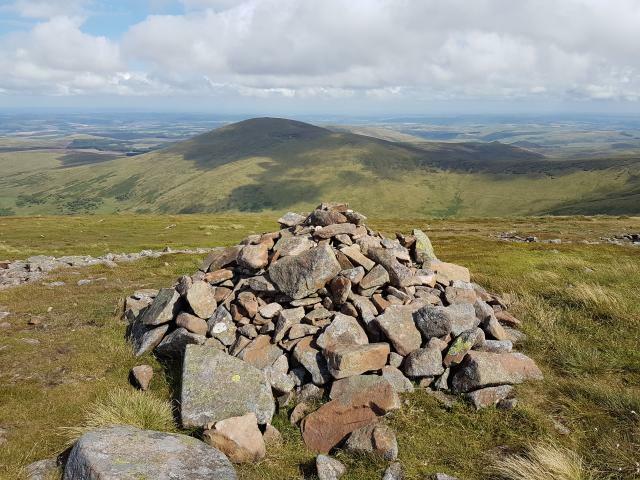 Due to the flat moorland summit there are better views on many of the other Cheviot hills but I've been wanting to do this one for some while. 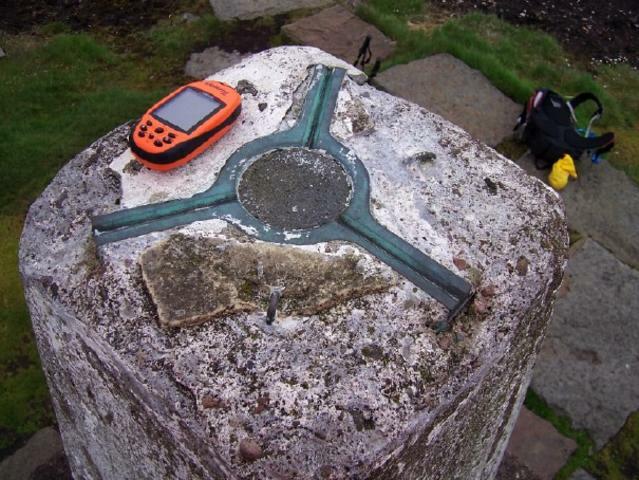 According to a local the trig was at ground level once but had to be raised as the ground level had sunk. Not sure if this is true. Flagstones were very welcome. 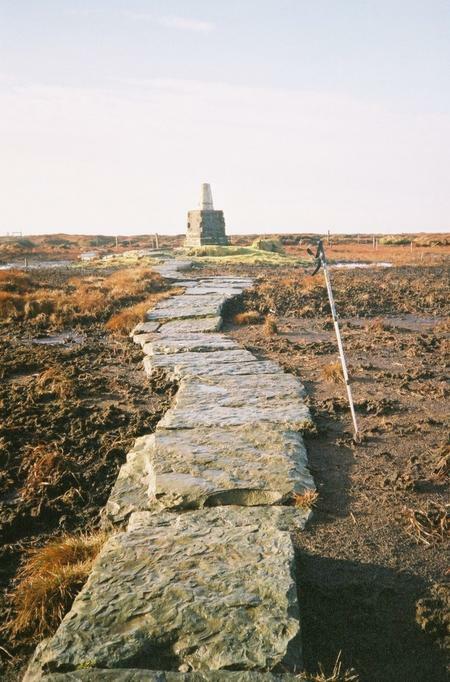 good paved path up from pennine way though it is one huge bog on the summit. Getting to the top Almost 19 years since the last time I was on this summit. 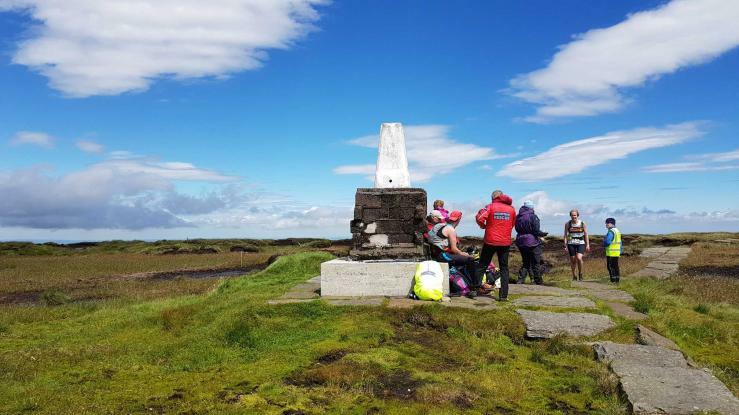 Pennine Way Day 2 of 17. Set off carrying too much beer so wild camped outside Auchope hut and drank it all. 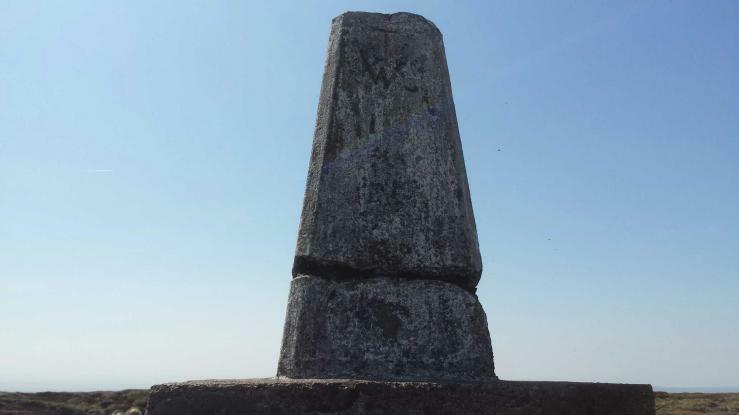 Leaving 23 miles to walk to Byrness today, so credit to us for bagging the Cheviot Summit - many others leave it out - which I don't understand. 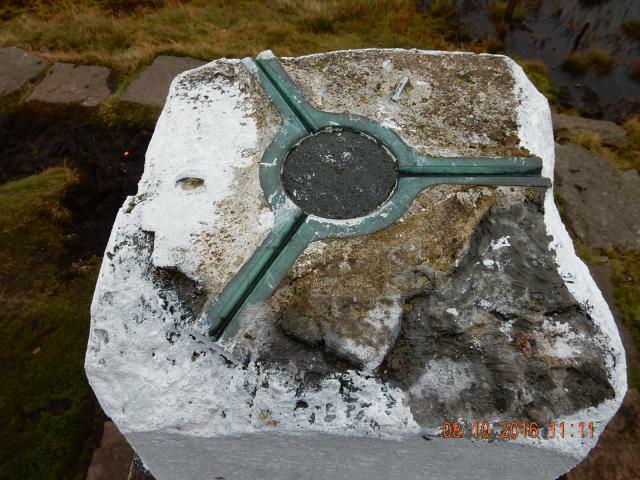 Trig is perched on a plinth and is slightly damaged. 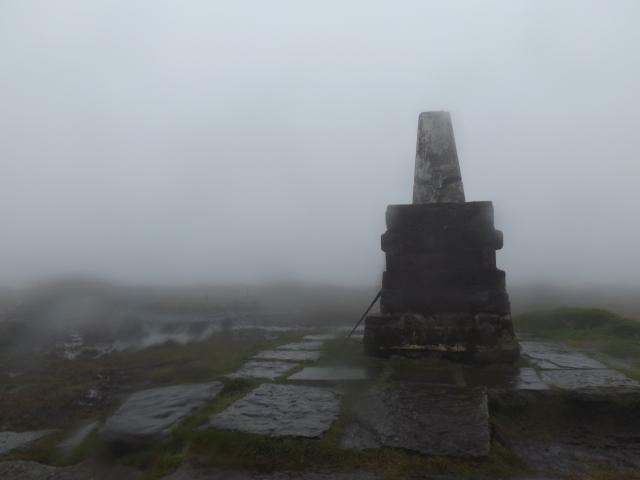 Views slightly restricted by the summit massif, however I rate them and for me its worth the effort, especially as this becomes my highest trig bag for now at least. 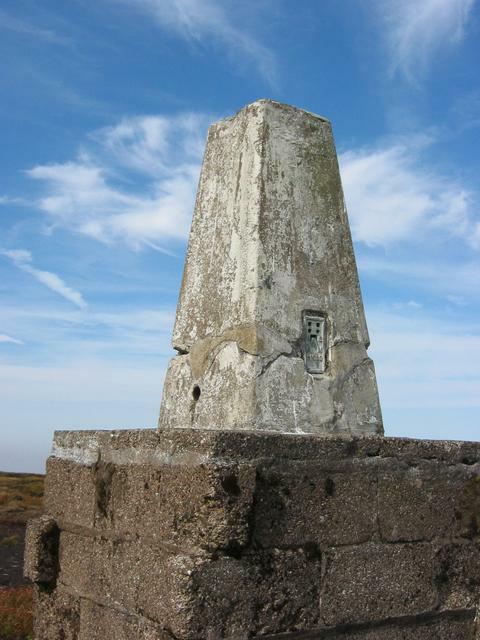 Great 12 mile walk taking in Cold Law trig, Broadhope Hill, The Cheviot trig, Comb Fell and Hedgehope Hill trig, lovely and sunny, great views and another county top. Logging from my walk along the Pennine Way last year. Absolutely brilliant walk. Parked at Langleeford and trudged through the deep snow all the way to the summit and back to start. 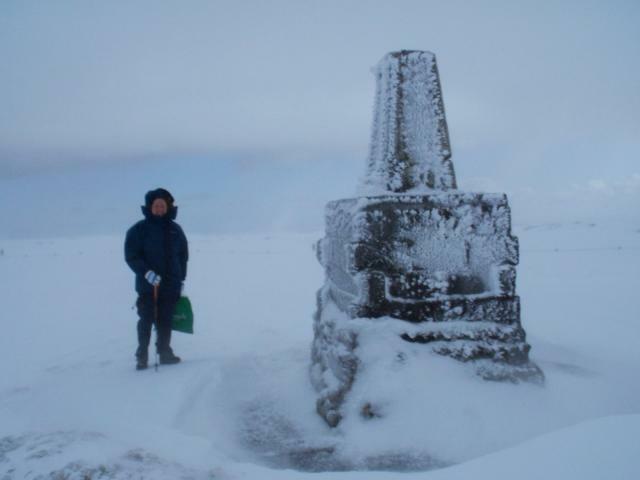 The trig was completely blasted in snow. This visit was just Nick, a year before Rosie! 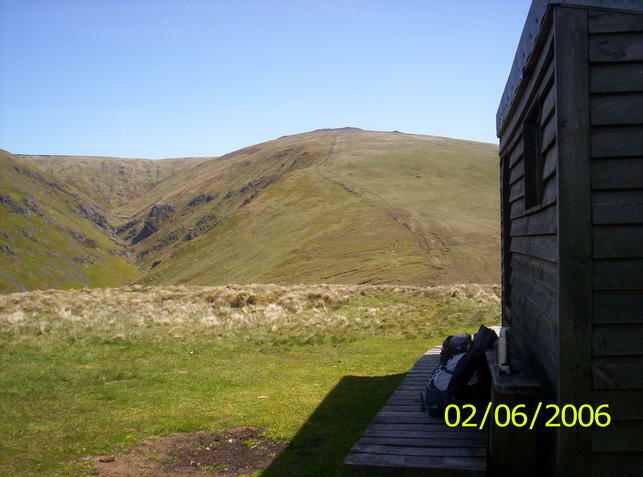 Ascended from Hawsen Burn and up Snear Hill in freezing conditions but pure blue skies. The pig wire fence up the side of the hill to the summit plateau had become hundreds of metres of rime ice formed into perfect 6" x 6" cubes, the photos of which I took got published by BBC News. 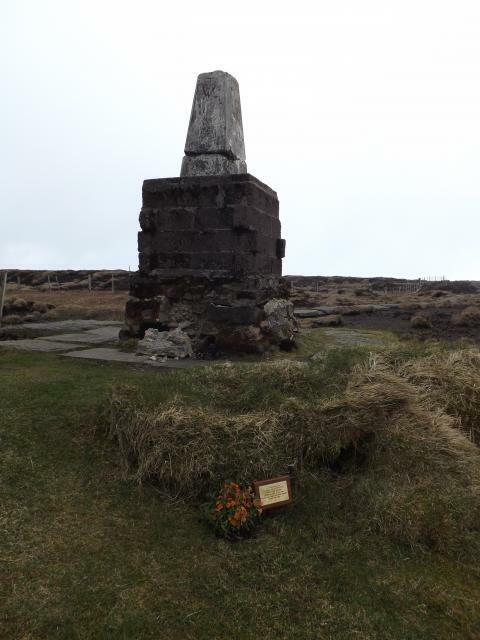 Second visit,very windy but no rain.Thank you for the flags stones whoever it was did all that hard work. 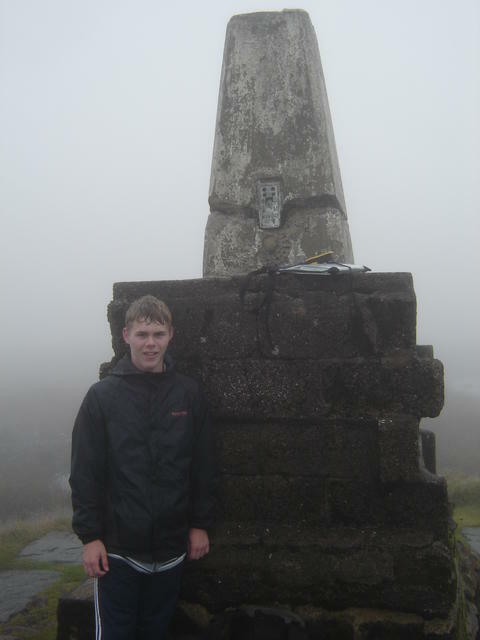 Completed during The Harthope Valley Horseshoe that also included Hedgehope Hill and Combe Fell. A fine day with clear views and pleasant walking. The extension to the paving over Cairn Hill has been completed since my last visit. Ground was also suprisingly dry. Damaged at FB height also top corners gone. Asphalt plug in Spider centre. From Breamish valley as part of a 24 mile circuit. 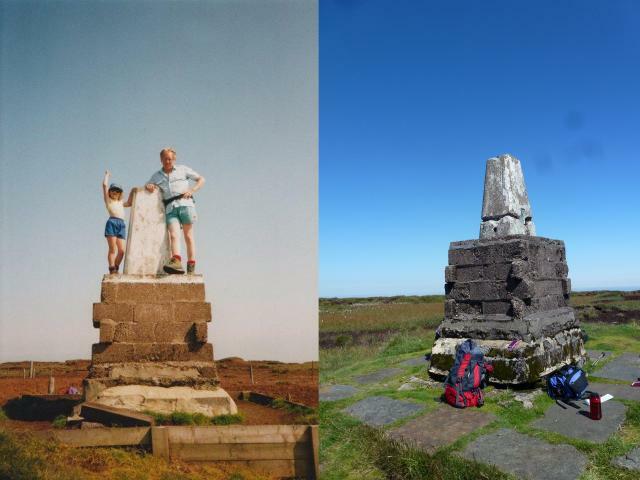 Previously visited this highest bog in England 1974, 13/08/00 & 06/10/05 no trig details noted. Second of the day from Hedgehope Hill on the way to Cold Law. A long way via some spectacular peat hags! Not as wet underfoot as we'd imagined but we were thankful for the paved section across the summit. 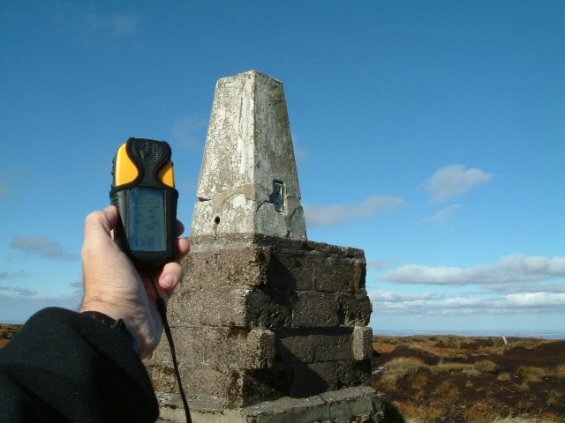 No views to speak of from the top and the trig as other have said is in a sad state. Second visit. 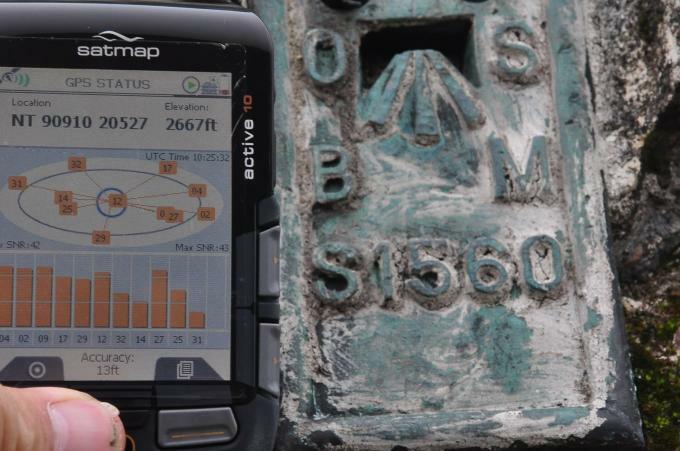 For GPS reading and photographs. 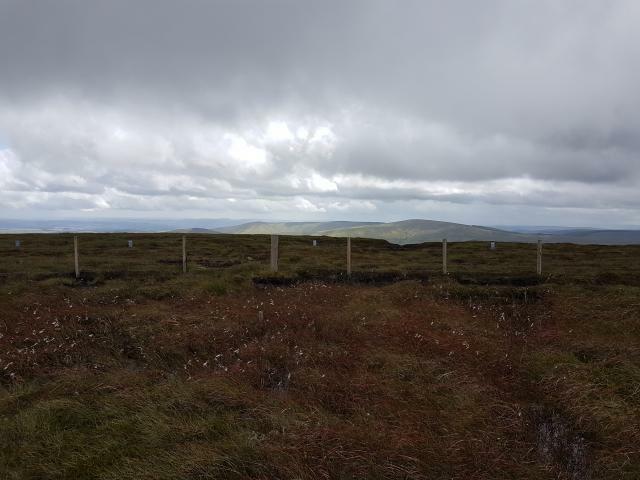 SITE VISIT: The summit is very flat and is one big peat bog for some considerable distance. A flagstone path across this summit has been meticulously laid. 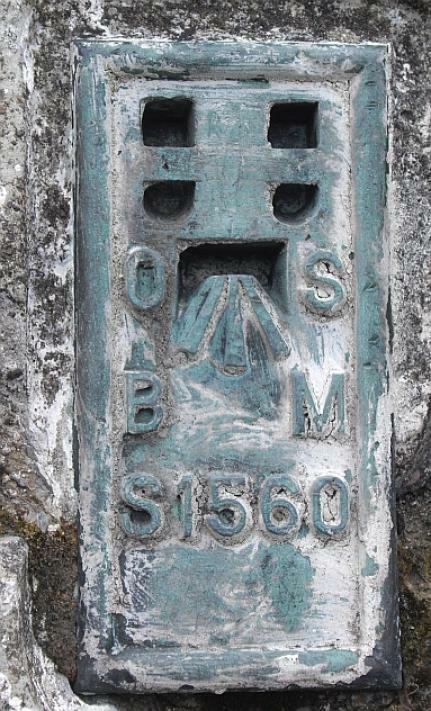 The probable reason for the elevation of this pillar is to permit line of sight with neighbouring pillars. Pillar cracked through at FB height. This crack is gradually expanding with weathering. Deteriorating. Spider centre plugged with tar. 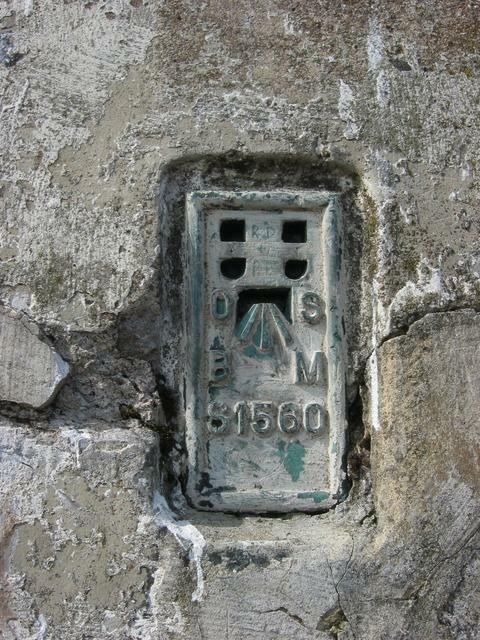 Flush bracket faces ENE, ~109�. Full 360� open panoramic skyline with limited views due to the expanse of this flat top, and its height above everything else for miles around. 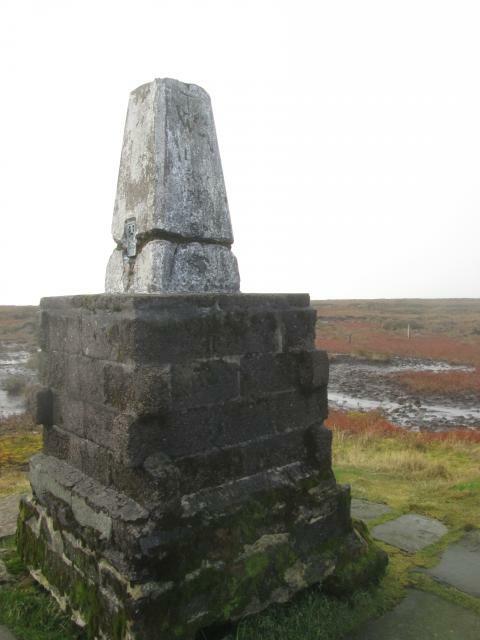 Walked here from Hedgehope which is a far better hill...black wet and boggy. done after hedgehope. Great weather. Came up from the north side, top very flooded where not covered in snow. 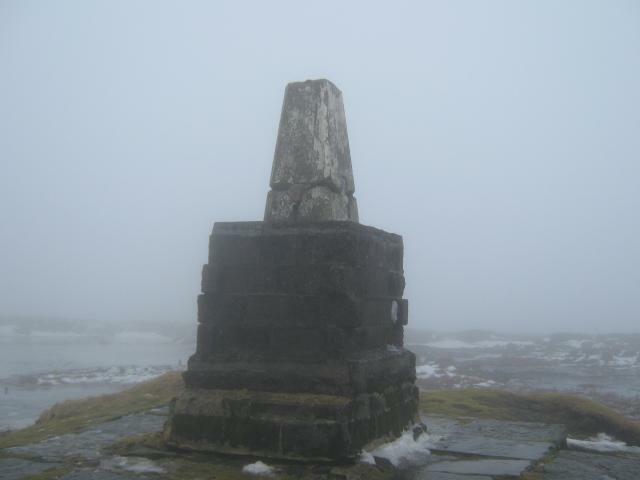 Poor weather today, ascended by following the Harthope Valley to its head and climbing to Scotsmans Cairn. The valley was very wet underfoot with numerous landslips. Cloud down but only drizzle. 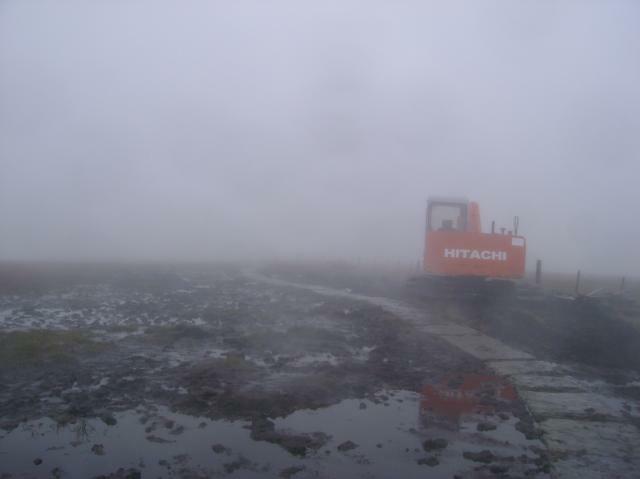 Suprised to see a digger on Cairn Hill. They were extending the paving stones to the signpost - at last!No views. From Cocklawfoot, via Kings Seat. During a mini-heat wave, so no Pennine bogs to worry about. Astonished on the approach to see the trig bedecked with Tibetan prayer flags - a thanks for a safe ascent of Everest, according to the notice left. The positive bits - great weather, v.light breeze & mild. 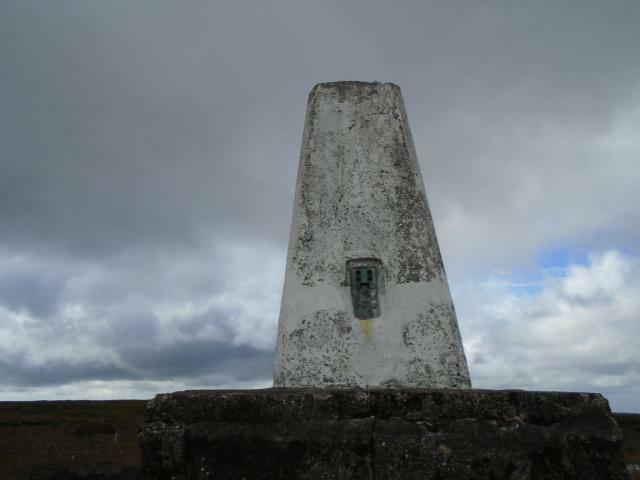 Got sight of the trig point when I thought I was only half way up and approaching the summit of Scald hill. The negatives - still hurting a lot after my exploits of TP2229 earlier in the week & the walk around to Hangstone Hill from here was pretty miserable due to the bogs. 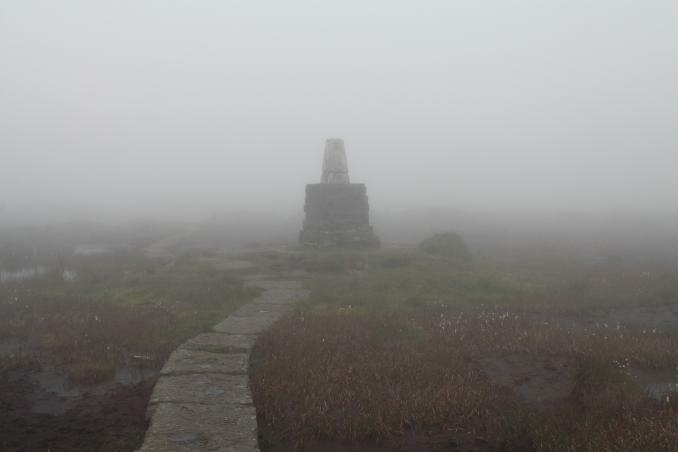 Views non existent, clouds too low to see more than 50yards. We shall just have to come back to see the views. Wide crack at FB level, top damaged. On concrete block platform: FB 2m above ground level. A few Cloudberry fruits en route. Showery day: raining hard at summit. 3h circuit from Langleeford incl Hedgehope. Repeat of the epic route done in February. 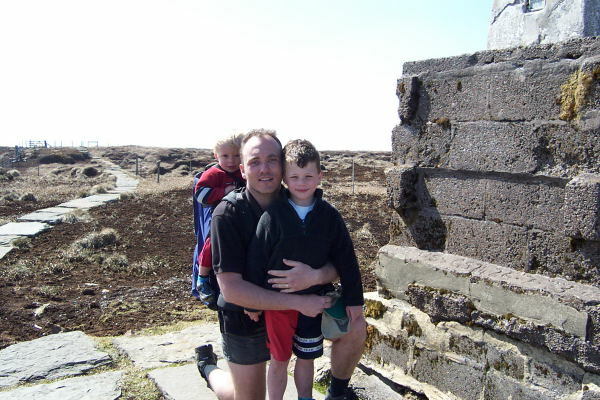 Great weather until we dropped down to Broadhope Hill and it dropped 5 degrees and bloody hailed! Didn't last long thankfully. Parked on minor road east of Langleeford and walked up via Scald Hill. 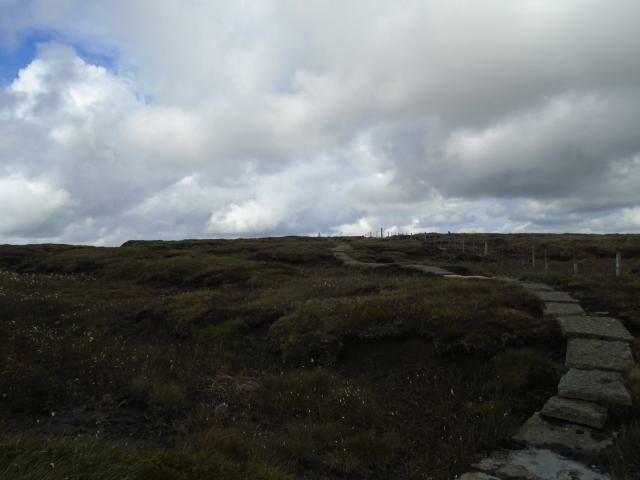 Superb views on way up, but top is raher a dissapointing featureless peat bog. 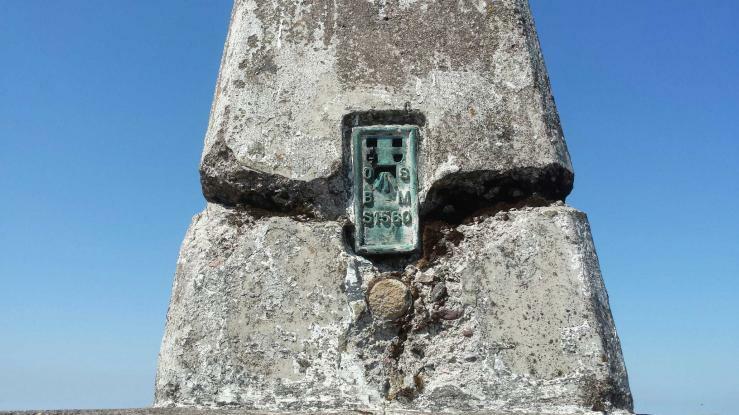 Trigpoint presnts a curious sight on it's massive foundation block. Pillar in poor condition with large horizontal cracks. Painted white but FB painted green. 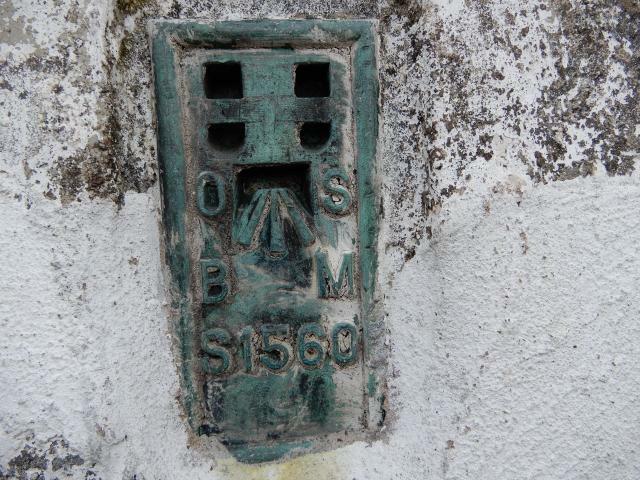 Did not climb onto foundation to check plug due to dodgy knees! Glorious weather today. Warm, sunny and clear. 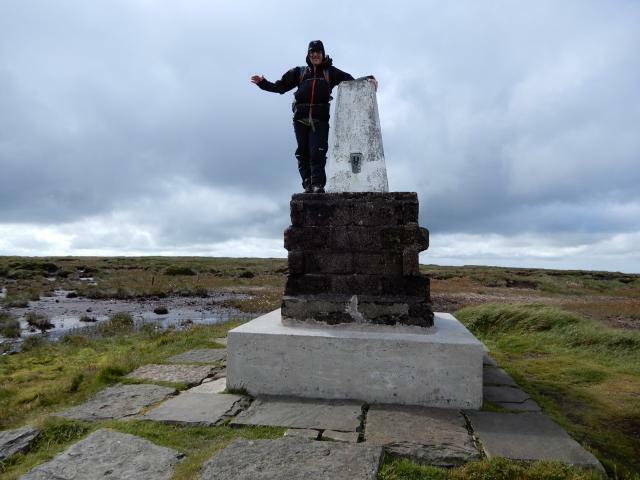 Bagged this halfway round a 19 mile epic from Old Yeavering, via Newton Tors and College Valley. Long way back mind! From Langleeford, now onto Hedgehope Hill. 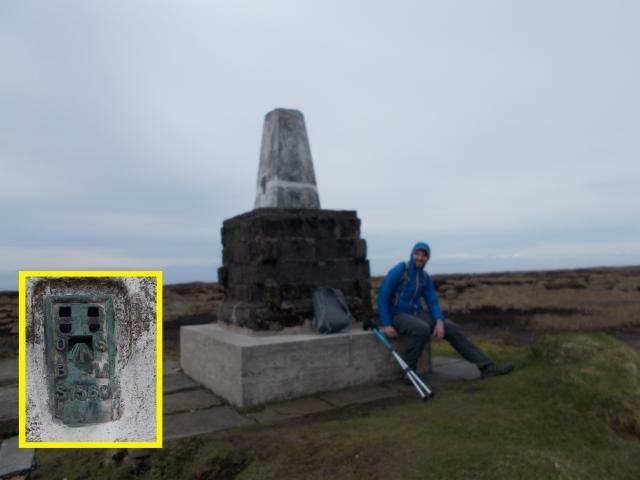 Much easier to reach trig now than it was in 1984. Ascended via Hen Hole and College Valley. An after the event logging. It must be 20 years since I last came up here, with a party from the NMC, and I am not going to go through my diary to back-write entries dating from 1971. 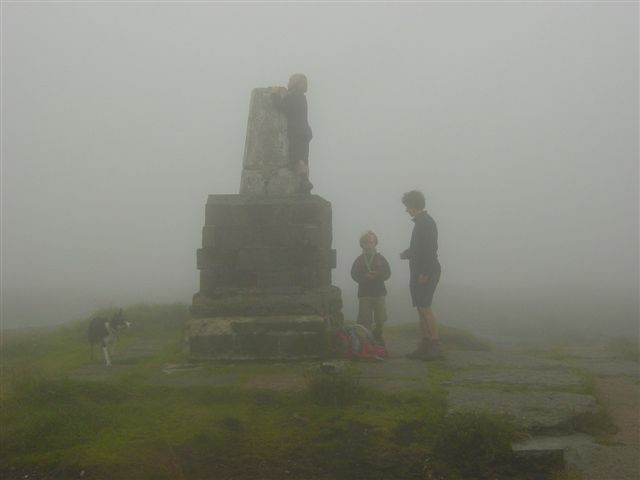 It was a delight to visit the summit in bright sunshine with my son before a thick wet mist drove in from the W and we took to our heels. Bonny caps of mist on Hedgehope and hills toward the Ingram valley. 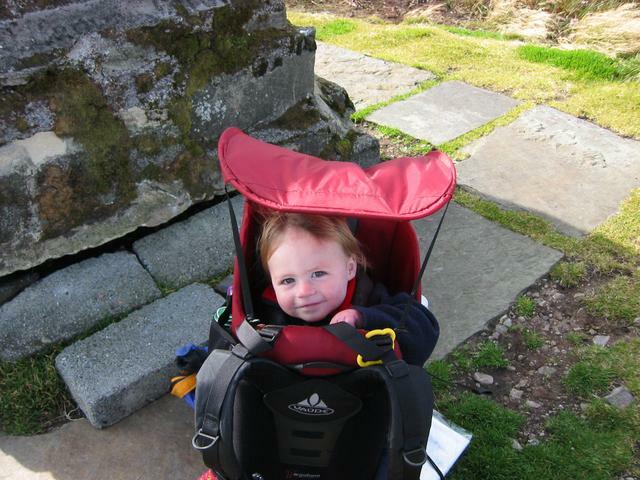 The score is for the retrospect of Holy Island and the Farnes from the stile at the beginning of the flagstone track. 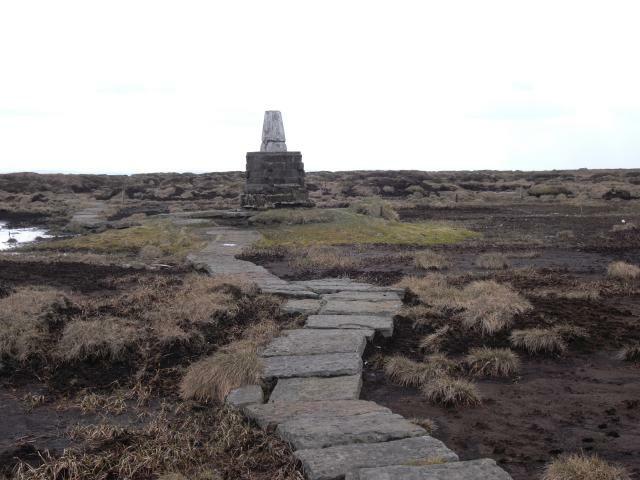 I noticed frozen MTB tracks in the peat - but it wasn't the Gansos', folks ! 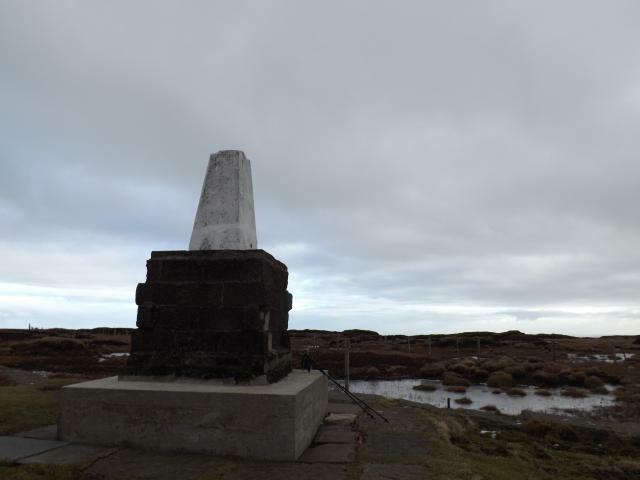 Stood on top of the trig for the first time today! Weather was crisp and clear, ground was frozen solid, views awesome. There was a heat inversion and Northumberland was covered in thick fog, with the Cheviots looking over this white sea. 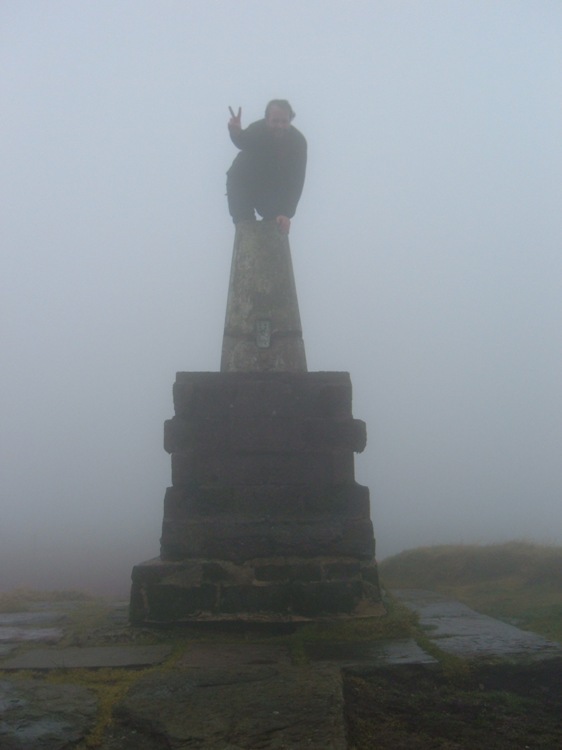 Did this on a horseshoe with Hedgehope and Comb Fell. Bagged this Maralyn whilst on a short break at Rothbury. 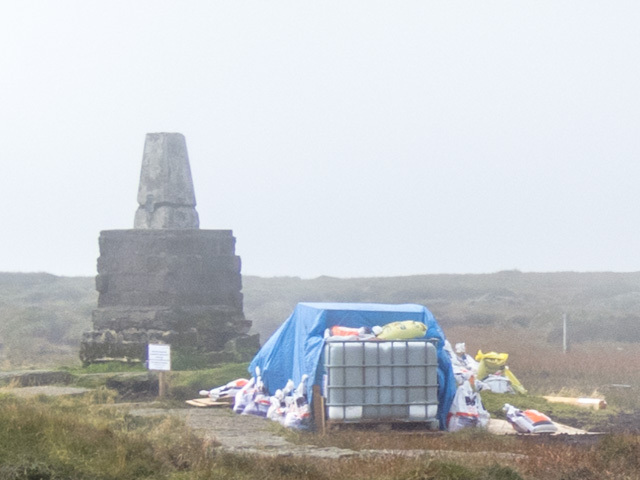 Not a very interesting hill in the mist, large areas of peat bog, thank goodness for a well set out path on the top which headed directly to the tp. 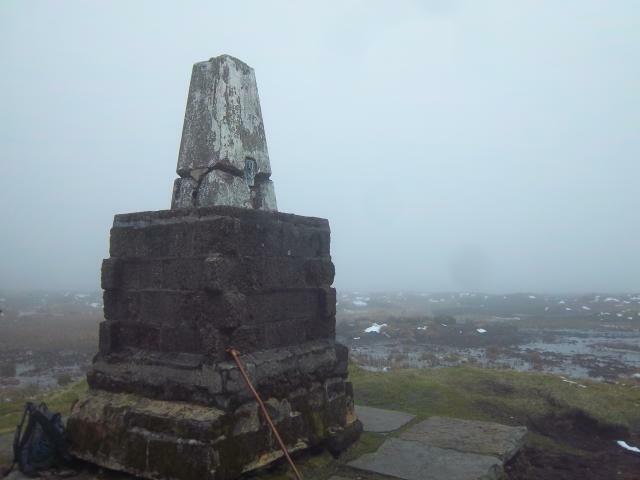 trig damaged and no view at all due to mist.path to summit plateau and trig paved in all the wrost boggy areas. Sits on a 2m plinth made of breeze blocks which is then surrounded by a area paved with flag stones. The concrete of the pillar is pitted and erroded with several cracks. 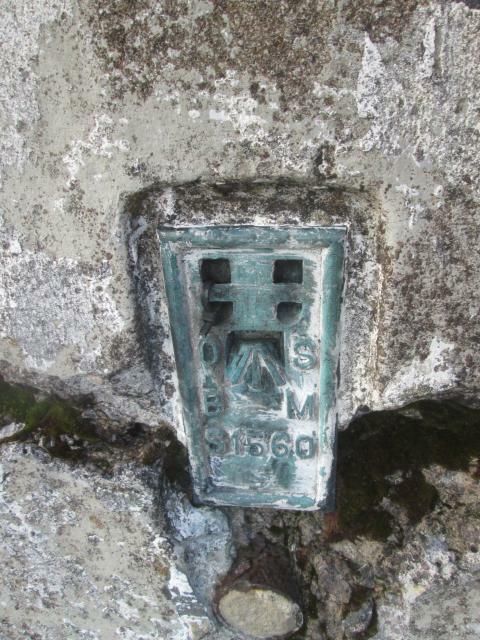 There is no top plug but the bitumen resin plug is in place. A big beast of a hill but not at all boring. Perfect weather today. Bagged this as part of a circular walk from Langleeford car park via Lambden Valley, Dunsdale, College Valley, Red Cribs, Auchope Cairn, Cheviot and Scald Hill. Cheviot plateau beginning to dry out for summer. 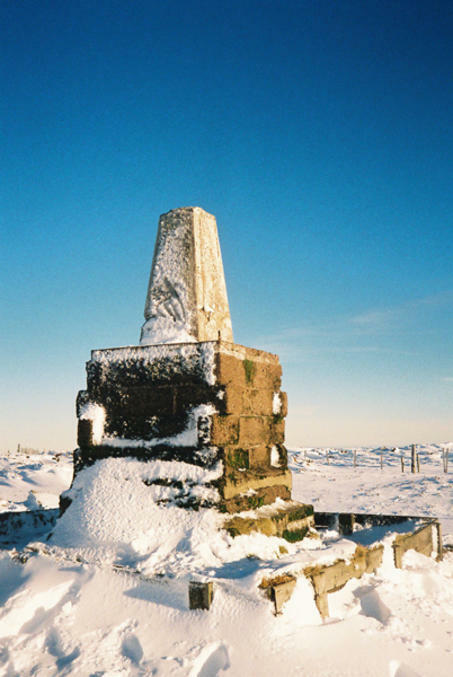 nice walk up through Hedgehope valley when reached the Trig quite deep snow in parts. On the way down very boggy, a lot of people have said Cheviot is a dissapointment and since this was my first time have to agree with them. Lead a friend up via Scald Hill and returned down Harthope Valley. Still my least favorite hill/mountain, Hedgehope Hill next door is far better. 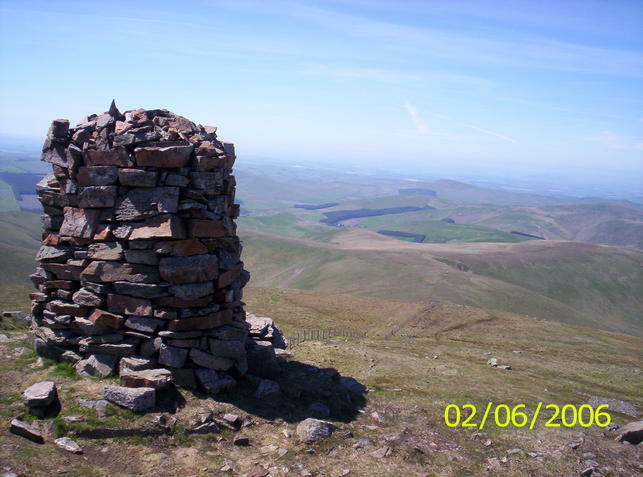 I heard a rumour that the Cheviot trig is sinking and it does look a little lopsided. Poor view from TP, Good walk up from Scald Hill. Far drier than other approaches. Impressive TP for bait stop. 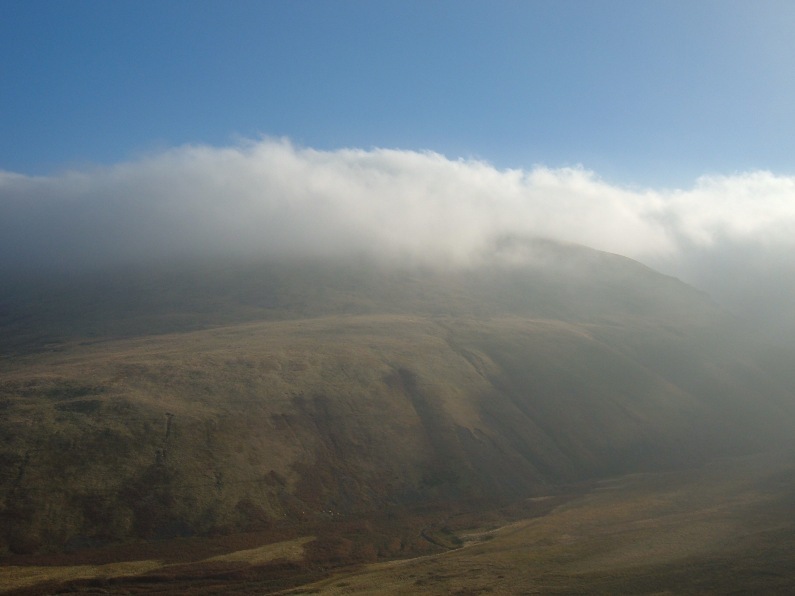 I can imagine what the view might have looked like, had it not been horrendously foggy... the walk up, through College Valley and past Hen Hole, was marvellous! forgot my camera-well my brain was melting in the heat! Straigh forward ascent over Scald Hill from CP (NT 954225) near to Langleeford in Harthop Valley. Above date is of most recent visit of three. First visit on 04/08/1981. 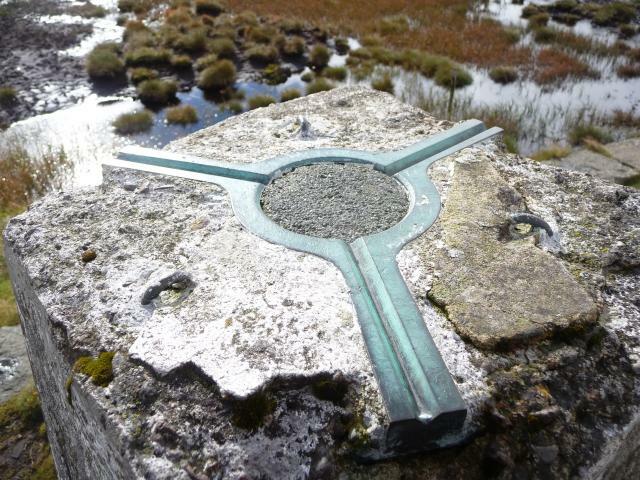 Trig point on top of plinth of concrete beams in middle of desolation of peat. No view today. Miles of stone slab path round here now ! Sunny at the top, walked back down to the car and it started to pour down.I had driven here, 25 miles from campsite as swmbo and kids bit not want to come, so did not ride to the start of the walk on the bike else would have been out all day. A glorious walk today with hardly a cloud in the sky. You can see most of Northumberland today - a really lovely day out. Lovely hill, and plenty of people out today enjoying it. 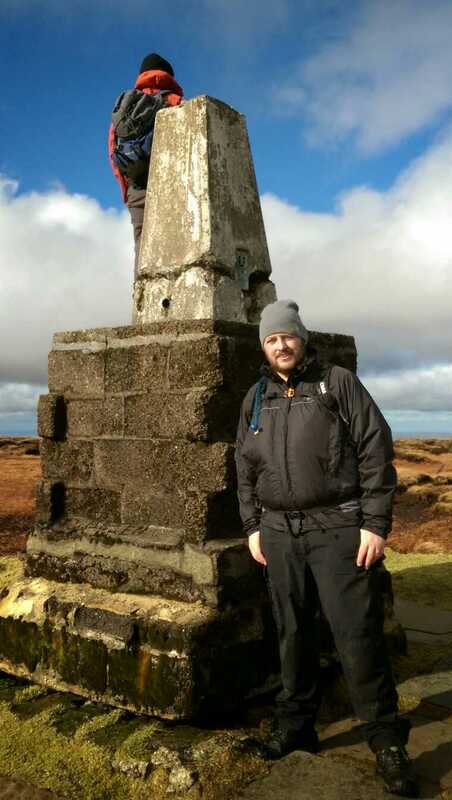 Easily the most challenging walk I've done so far with David on my back (13km, 600m height gain), so the trigpoint was a welcome sight indeed! 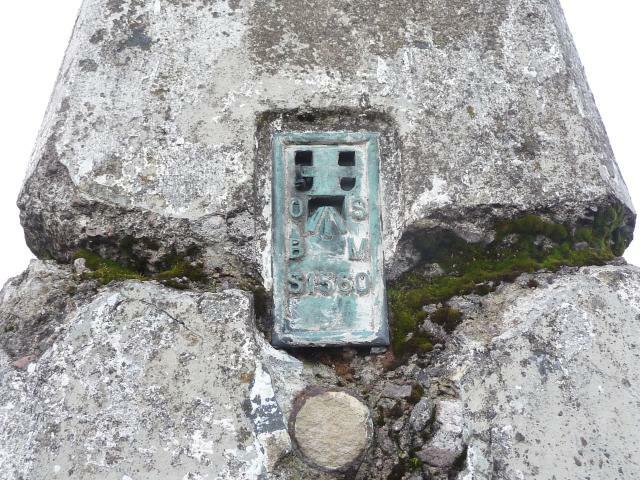 The trigpoint has seen better days, though the major cracks in the concrete have been repaired somewhat. See my house from here! Visited during a long day on the fells. Wonderful winter conditions. Up from Langleeford, then round to Hedgehope Hill. No problems with frozen bogs. 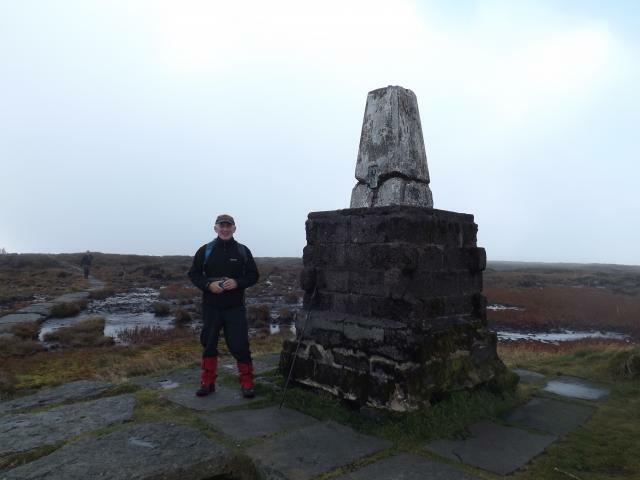 Walked all the way round to the hen hole from Langleeford then over peat bogs to summit. Visited on my birthday. 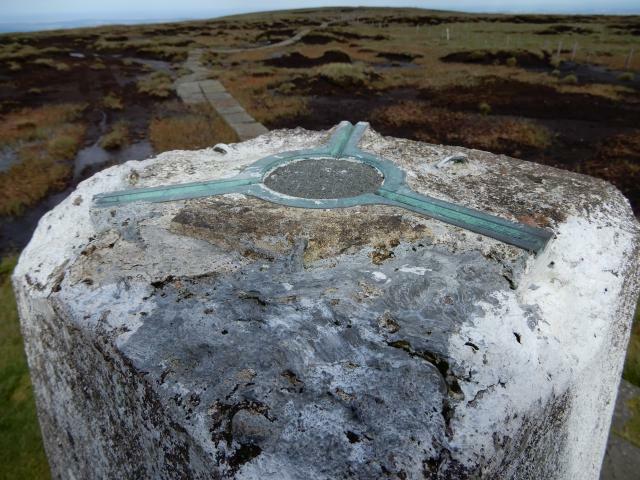 Part of the "Nuttall" The Cheviot walk (8.1) with the trig at Hedgehope Hill also being visited. Logging this 18 years after I found it. I discovered a photo in the loft which had a date on it. 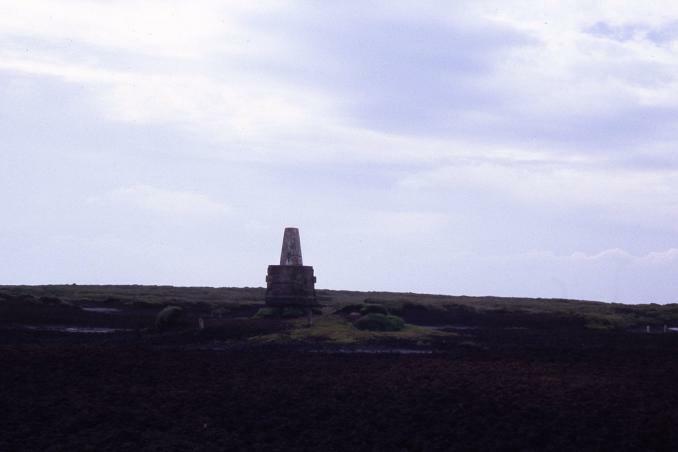 Finally crossed the sea of peat to the pillar on top of its strange tower. Well its one answer to the visibility problem on a vast plateau. Walk off tamed by paving slabs. 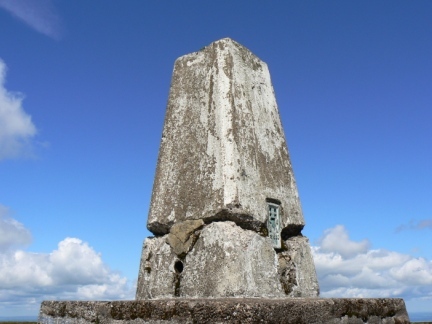 HISTORY: Pillar completed 10th June 1936 costing �49.16s.8d. Computed as primary triangulation station PP308 within Figure 3 of the OSGB36 Primary network during 1937. 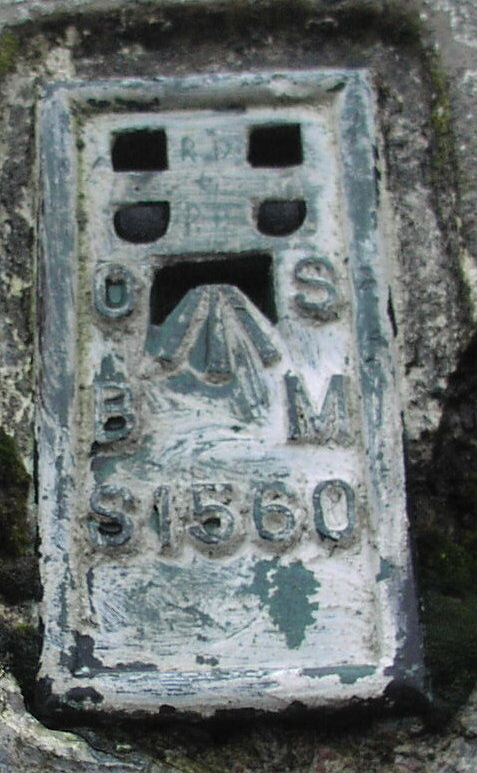 Flush bracket levelled for height in 1958. Last maintained by the OS in August 1993. 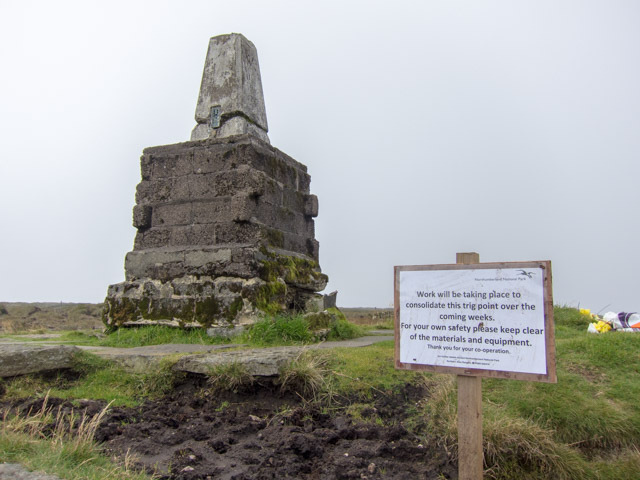 SITE VISIT: Trig pillar cracking around base where previous repairs have been made. 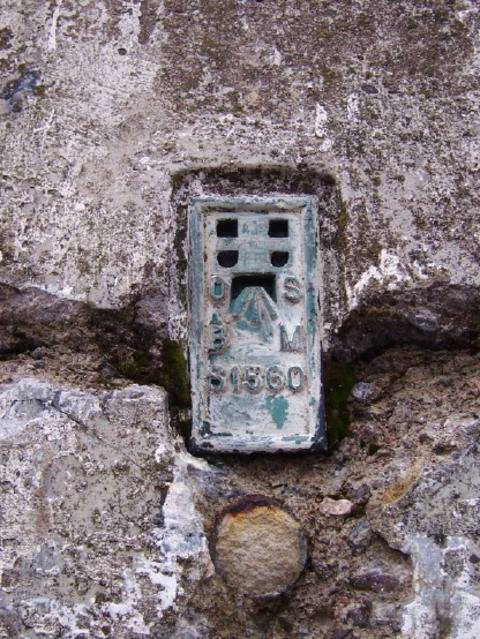 Spider no longer retained an OS centre plug. Foundations of trig pillar are now well above present ground level but are protected by surrounding breize blocks. 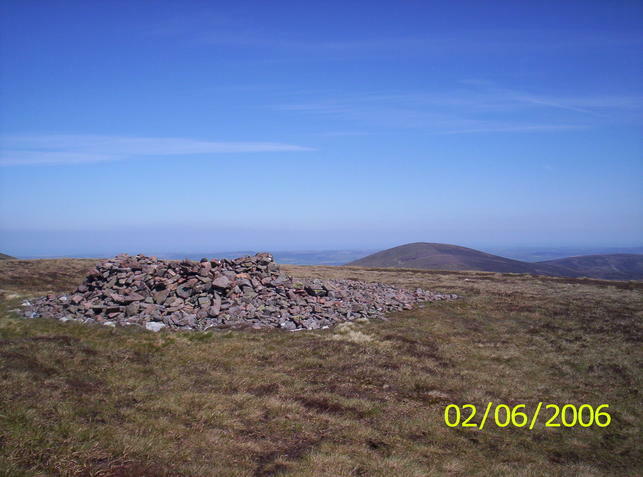 The summit is very flat and is one big peat bog for some considerable distance. A flagstone path across this summit has been meticulously laid. 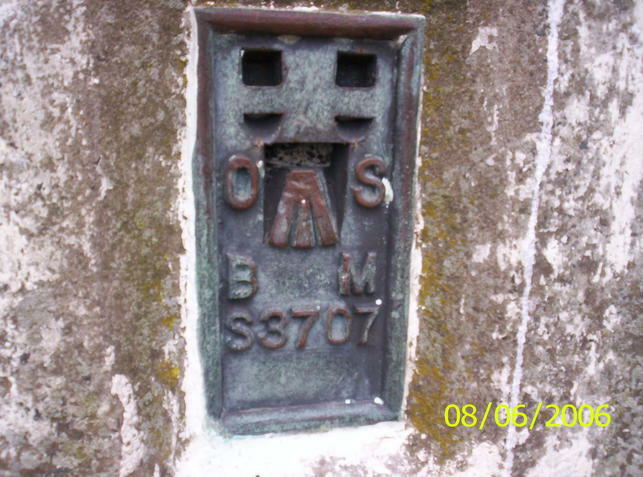 The probable reason for the elevation of this pillar is to permit line of sight with neighbouring pillars. Nearest public transport is at Wooler, but it is possible to do this in the time between first bus out (from Berwick Upon Tweed) and last bus back. 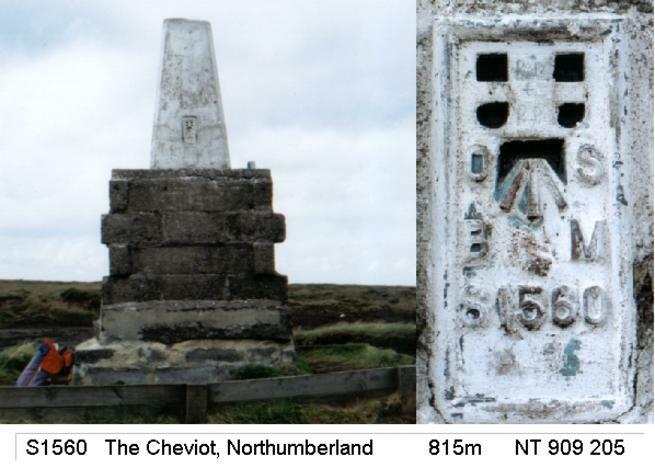 S1560 - The Cheviot Trig pillar & flush bracket. At last the big one! 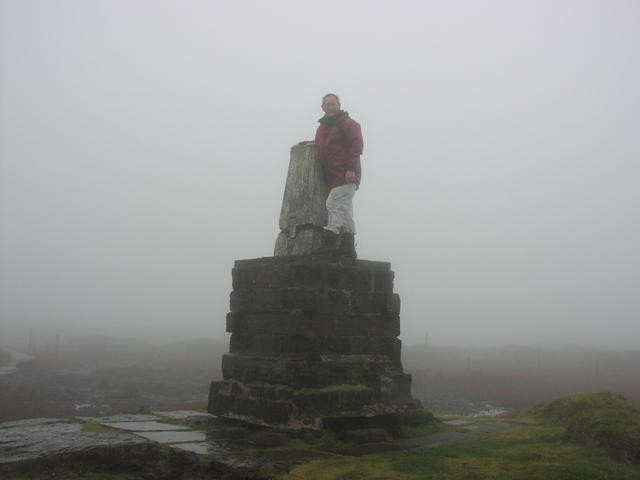 Northumberland county top and highest trig in England outside Cumbria. 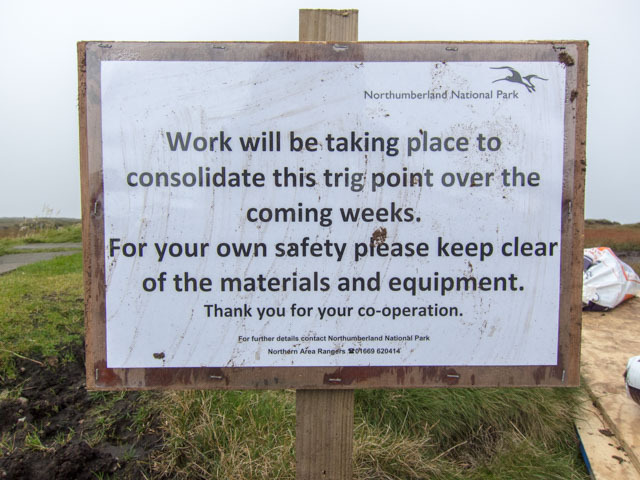 Trig itself is 3m above the eroded peat. Can highly recommend the ascent from Cocklawfoot. Much better than that from College valley. 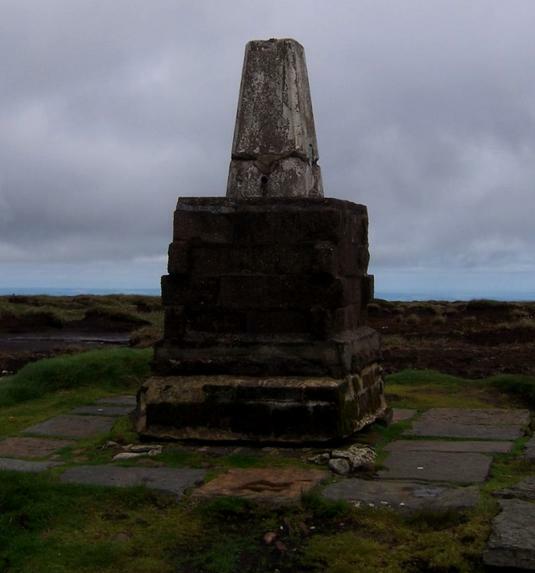 The trig is on a very substantial plinth. 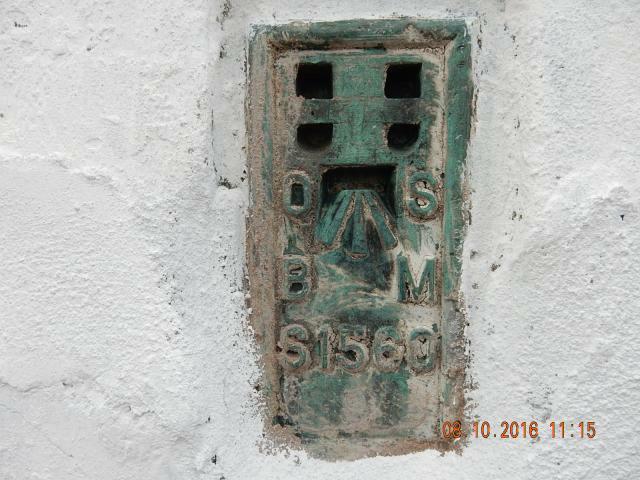 Painted white, Plug with heavily indented lettering. Very wet, lost trainers in mud many times. 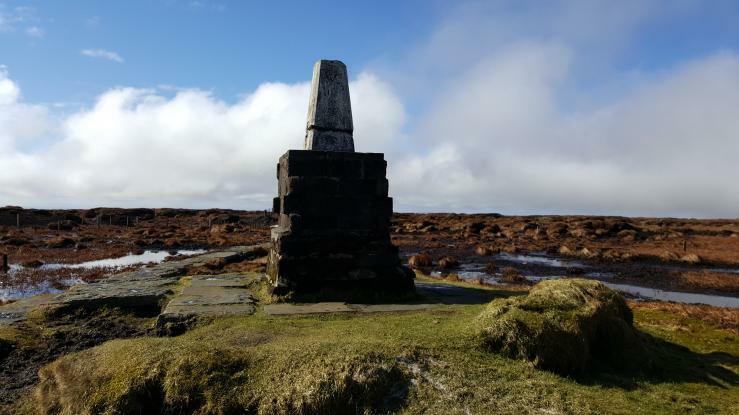 Enjoyable walk from Halterburn along Pennine Way until the last 10 yards where the pillar is surrounded by a deep peaty morass. Easter, and very miserable it was too! 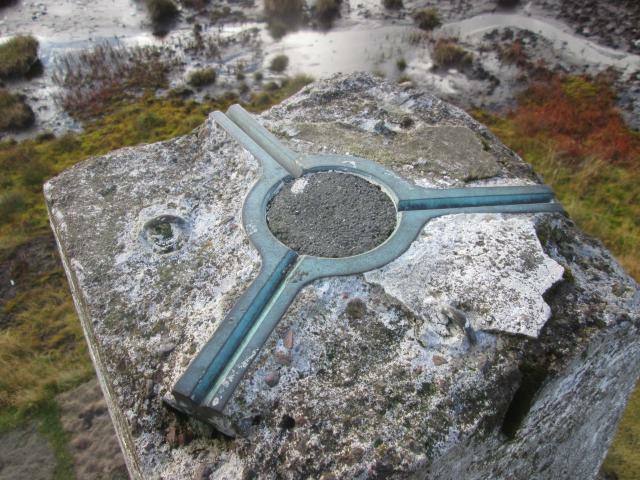 Trig on a plinth on an island in a tarn. Cheviot Had crack around at FB height. Walekd in from east via Scald Hill and returned via Harthope Valley. 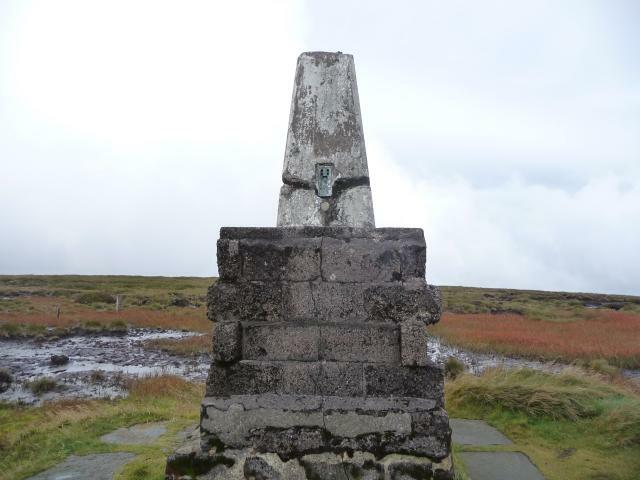 On a breezy day with light cloud the end of the Pennine Way is in range. 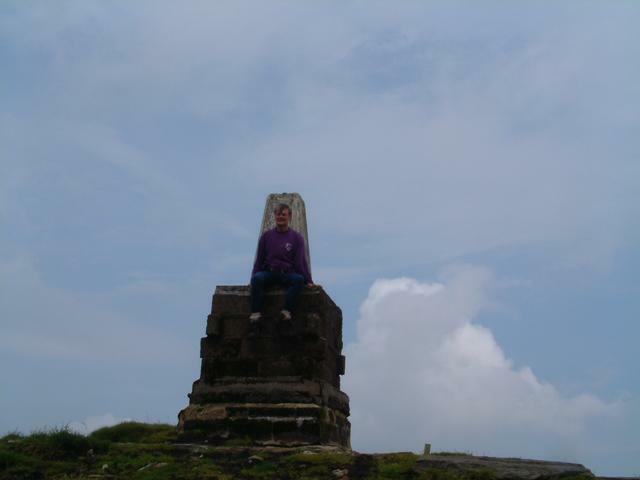 Climbed up on to the trig which is elevated well above ground level presumably by erosion. At least with all the recent dry weather the peat was not the wet morass it can be. score 8 for effrontery! Surrounded by 100 yards of sludge! Up to my knees and couldn't move - got out by crawling to a firmer patch. Column on a 6' stone block itself raised from surrounding desolation. Nothing to see (mist). 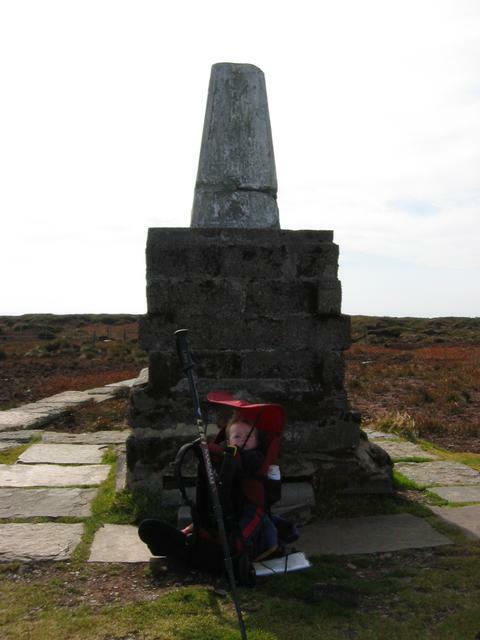 No other PW walkers attempted the journey!